AFN National Chief candidate Russell Diabo, Mohawk, on left of Wolverine, the late Secwepemc traditionalist and sovereigntist, at Wolverine's farm in Neskonlith. This summer the Assembly of First Nations (AFN) has been refreshed by a certain candidate running for National Chief, whose participation lends the organization rare credibility. Russell Diabo knows he has quite a mountain to climb in order to win. But he is already achieving one objective: to use the candidacy as a platform to alert the Chiefs and the people to a dramatic and impending crisis in Canadian legislation affecting the Indigenous. Diabo’s message is not simple. His perspective is informed by thirty years in Aboriginal politics. In a nutshell: he is anticipating the legislation of a suite of Aboriginal rights. This suite of rights will reflect Supreme Court of Canada decisions about Aboriginal rights since the 1982 Canadian Constitution. Because the Courts have never recognized the fullness of Aboriginal rights, the coming legislation will consolidate into law a far inferior kind of right than the rights which the original nations actually possess – which are equivalent to the internationally recognized, and protected, rights of peoples. This downgrading, believes Diabo, will result in the municipalization and incorporation of Indian Bands, or First Nations, and funnel the communities into a process of total assimilation within Canada. It is possibly the fourth phase of the process that was initiated by Prime Minister Pierre Elliot Trudeau – flowing from the infamous white paper policy of 1969, where the objective of dismantling the Indian Act and therefore making all the Indians disappear was only barely concealed. Check this link to hear the full interview. The nations of the broken treaties and the unsurrendered but illegally occupied Indigenous nations have one existing vehicle in which to travel together, politically, towards redemption. And towards reparation, repatriation, compensation, and restitution. That existing vehicle is the Assembly of First Nations. Diabo’s vision for the AFN is revolutionary, beginning with taking an axe to the “Termination Tables,” as he calls them, where First Nations “negotiate” for less rights, less land, and a short term supply of cash, under the Comprehensive Claims Policy. All negotiations with Canada are driven to the extinguishment of Indigenous land rights, and towards “certainty” for the colonial governments. And continuing with throwing a bucket of cold water on Canada’s so-called “10 Principles for reconciliation,” which should wash off the façade and expose the fact that Canadian double-speak in terms of its policies towards Indigenous peoples is an endangered language. Diabo’s travelling campaign is called “The Bannock and Bologna Tour.” There is no disconnect between him and the people. Presumably that tour will soon become the “Bannock and Bacon and Strawberry Jam Tour,” if elected. But National Chief Diabo will not stop travelling to the communities once elected. The purpose of the AFN is, was once, to unite the colonized peoples against the colonizer. This requires a lot of communication. In person. What Russell Diabo brings to the electoral race uniquely is his enthusiasm for the self-determination and land rights of Indigenous nations, rather than promising to deliver program funding from Ottawa. Diabo has been very involved in United Nations forums concerning Indigenous rights for decades, something that puts him completely past the other candidates. He has been involved in UN procedures concerning many forefront issues, including the BC Treaty Commission, and its attempts to coerce land and rights surrenders out of impoverished communities; the Red Response to Bill C-45 in late 2012, also “Idle No More;” the Wet’suwet’en camp at Unistoten, blocking pipelines and reoccupying land; the Barrier Lake Algonquin reoccupation; and more. 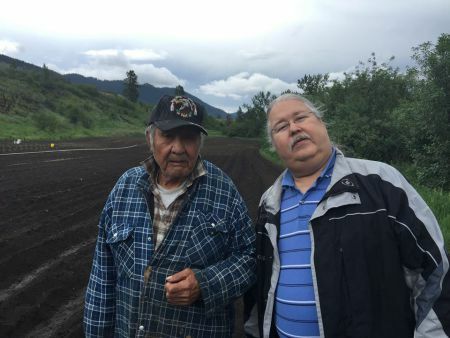 Diabo went to the Secwepemc reoccupation taking place on the proposed site of a Kinder Morgan worker camp – instead of participating in the AFN leadership debate. “It is Aboriginal title territory, and the people who hold that title are the community people themselves: the families and the communities that make up the nation. This effort by the Tiny House Warriors is a good way to bring attention…to the fact that the Prime Minister is ignoring their Aboriginal title and pushing this project through.” He was quoted in an online article by APTN. The most important right recognized in the United Nations Declaration on the Rights of Indigenous Peoples (UNDRIP) is the right of Indigenous Peoples to self-determination. This is now enshrined in Article 3 of UNDRIP, which replicates Article 1(1) of the International Covenant on Civil and Political Rights (ICCPR) and the International Covenant on Economic, Social and Cultural Rights (ICESCR) and makes it clear that this right applies to Indigenous Peoples. The right to self-determination is the overarching umbrella right; much of its essence is then spelled out further in UNDRIP, in regard to land rights, governance and Indigenous free prior informed consent (FPIC). The National Indian Brotherhood (NIB) had been amalgamated out of solidarity between Indigenous nations and national organizations fighting their common enemy, Canada, over fishing rights; hunting rights; rights of families to keep their children and basically every other right: which are all violated by Canada when it denies the national character and autonomous standing of the nations. So the position of AFN National Chief holds considerable power. The National Chief holds the power of voice. The state’s “talk and log” strategy, identified as such by the late, great, Chief Qwatsinas of Nuxalk, relies on the kind of talking that goes on for years and achieves nothing, unless it achieves a doormat endorsement of Canada’s genocidal policies, practices, and propaganda schemes. Elected leaders attend endless meetings while logging companies, development companies, miners and oil drillers and oil pipeline builders and institutional assimilation developers carry on the important work of liquefying the national assets of Indigenous nations, be those assets natural resources, women, or children. Diabo intends only to talk long enough to make his demands. Then he will wait for an intelligible answer. But he won’t wait very long. If the AFN’s statements and interventions to the several UN treaty bodies had ever been as bold and clear as the ones Diabo and his longtime friend Arthur Manuel have been making over the past decades, it is unlikely that people in Canada would be dithering about the catastrophic condition Indigenous peoples are in. They would be coming into that period which South Africa experienced in the late 1980s, with most of the world refusing to trade with them until apartheid was truly disintegrated. In an interview with The Georgia Straight, Diabo put the land question in a nutshell. Since the Canadian Constitution of 1982 affirmed the existing rights of Aboriginal peoples, politicians have bought themselves all this time by philosophizing about “whether self-government was an inherent right or a conditional right depending on agreements with Crown governments. The national Aboriginal organizations said, ‘No, it’s an inherent right. It’s already in the Constitution; it’s already an existing Aboriginal right.’ The premiers and the prime minister said, ‘No, no, no, you’ve got to reach agreement with us.’ ” And that is precisely what the fuss is about. Canada uses its power to deny the peoples’ existing rights, in order to access all the natural wealth of this, their half-continent. Unfortunately, since at least 1995 the Assembly of First Nations has scandalized traditional Indigenous peoples by its leadership’s preference for government program dollars over land and freedom. The AFN is the summit of the Indian Act system – all elected Band Chiefs gather and carry out administrative tasks required by the Canadian government to create the appearance that native people have a role to play in their own affairs. The Canadian government refers to the AFN, when it is peddling its own variety of colonial oppression abroad, as an example of Indigenous power and self-determination. The “democratic” election of a single Chief in each Band was legislated in 1935 as a requirement of the functioning of an Indian Band, in order to receive any kind of cooperation from Ottawa. This imposition on the traditional governance structures was often catastrophic, and was resisted by Indigenous adaptations such as in Líl’wat, where all the duly appointed family head chieftains would meet for a few days and come to consensus as to who their “elected” chief would be, and what was expected of him. And that chief had a lot of resources in the council that put him forward. The “democratic” election process has been exposed many times for what it really is. In Homalco, for instance, a fellow can get elected to the post of chief very neatly if his campaign literature includes hundred dollar bills, supplied by an Atlantic salmon farming company, against his anti-fish-farm competition for the office. The excess of cooption and capitulation, apparently for the sake of personal career advancement, saw AFN under National Chief Phil Fontaine become a party to the Indian Residential Schools Survivors’ Settlement Agreement – a lump-sum settlement process that killed a meaningful percentage of the wounded people who promptly drank or overdosed themselves to death with the cash. And the Agreement, with its compensation to child victims of astonishing crimes, paid out something like 10% of what court settlements produced. Fontaine also remained silent during the 2010 Olympic Winter Games in Whistler, BC – or, rather – in the non-treaty and stolen lands of the Líl’wat and Squamish, Musqueam and Tsleil-Waututh peoples. Former National Chief Fontaine has lucrative arrangements now with the Royal Bank of Canada and several resource extraction companies. Unless the media has managed to black out everything to the contrary, it appears National Chief Perry Bellegarde has managed to do and say nothing for four years. Canada would be very supportive of this kind of an AFN leader: all Canada wants is time to continue its worst greatest achievement: the total assimilation of some fifty Indigenous nations, brainwashed and disfigured by the relentless “serious bodily or mental harm” inflicted by the Indian Act... and all the individual Canadians, and groups of Canadians, which carry out violent crimes against the dehumanized peoples. The AFN’s operations are entirely and directly subsidized by Canada. It wasn’t at the beginning, when the National Indian Brotherhood was subsidized by bake sales and bingos. It’s unclear how the state-sponsored arrangements might fluctuate with a firebrand in office. In 1995, AFN National Chief Ovide Mercredi visited the Ts’peten Defenders at Gustafsen Lake, in Secwepemculucw, even as they were surrounded by 400 RCMP with tanks and weapons that are outlawed under international conventions. His visit was coordinated by the RCMP and resulted in many media events where the AFN leader was verbally despairing of the hardline position of Wolverine’s sovereigntists. In the pictures it looked like someone had his reproductive organs in a vice. Shawn Atleo astonished the world by ceasing to talk about Black Elk once he was elected from Ahousat to the national office and, instead, allowed his lips to be moved to the tune of the legendary Prime Minister Stephen Harper’s First Nations Education Act. In 1971, Indian Control of Indian Education was a show-stopping platform set forth by the NIB. It was detailed, determined, bound to be successful in reversing the assimilation function that “education” for Indigenous children has performed for almost two centuries. By contrast, the First Nations Education Act was a powerful tool for assimilation. But Chief Atleo compared it to the 1971 proposal. Former National Chief Noel Starblanket was most candid. Why was he not running again for the national office? He told someone that getting too used to the cafés in Ottawa doesn’t really help the Indigenous cause. The map of Canada should be redrawn, says Diabo. "They've severed everything north of 60 in this coming legislation. Everyone that signed treaties up there, the Yukon and Nunavut and some of the Dene, they're on their own now. And we now how they're doing - they're broke." "Canada keeps pushing this map on us, where we become tiny municipalities, with just as little power, and they have these huge provinces and territories. We have to keep holding on to our own map. We need to look at Article 46 of the UN Declaration on the Rights of Inidgenous Peoples, which says that no peoples can threaten the territorial integrity of a member state. But state or not, we should redraw the lines for ourselves." If the original peoples, confined by the invention of “Canada,” are First Nations, Canadians should consider the way their state - an industrial warehouse of epic proportions, populated by an enterprising and rapidly growing colony of refugees from around the globe - is an Assembly of Second Nations. Even the Supreme Court of Canada sits on land that has never been surrendered or sold to Canada by the people with the existing right of Aboriginal title to that property. "We have to change the way we're thinking," says Diabo, "and right now the AFN is not thinking that way." From Brotherhood to Nationhood, Peter McFarlane, Between The Lines press, 1993.